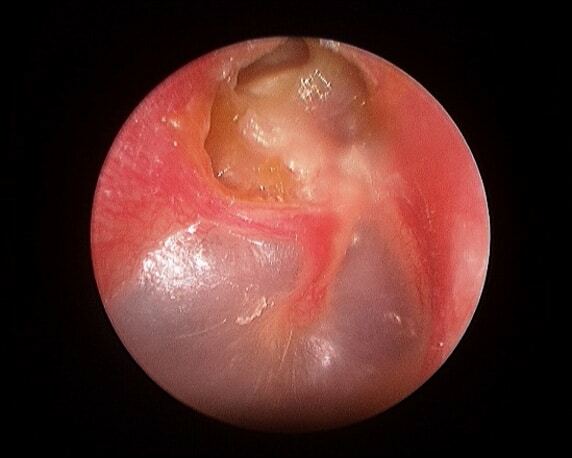 Cholesteatoma is a term applied to an invasive process of the middle ear. In essence it is the growth of skin into areas of the ear where it in not usually found. In most cases it is related to long standing eustachian tube dysfunction creating severe negative pressure within the ear. Once this has developed, the cholesteatoma can cause progressive destruction of the ossicles and thus hearing loss, and more rarely inner ear damage with balance affected, facial nerve damage and finally invasion into the brain. The usual symptoms are long standing discharge and hearing loss, although it can be essentially symptomatic. Normally there is a long history of ear problems, extending to early childhood. Once identified surgery is usually required, although the aggressiveness of this disease is variable. In general terms the aim of treatment is create a safe, dry ear, with attempts to improve hearing an important by secondary consideration. Picture of right ear: destructive process occurring in the attic of the ear.